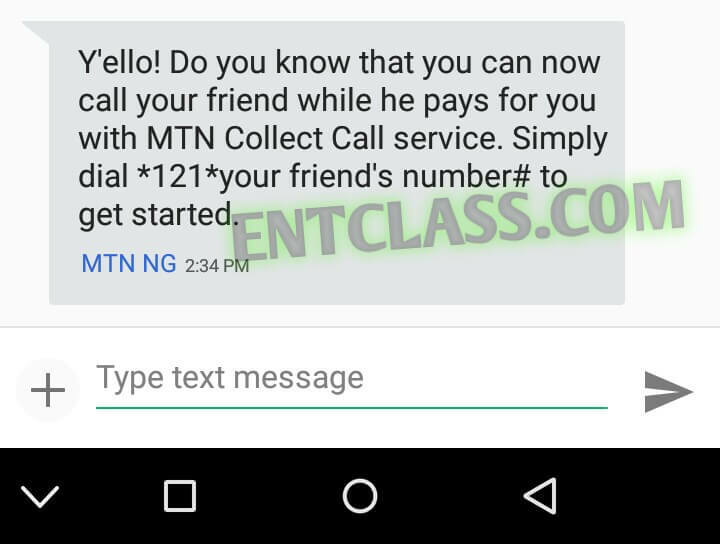 MTN has introduced a new service called MTN Collect Call. MTN Collect Call is an exciting service for you from MTN. It's just like Etisalat Receivers' Pay service; The reciever is the one paying for the call, only if they accept to pay for your calls. 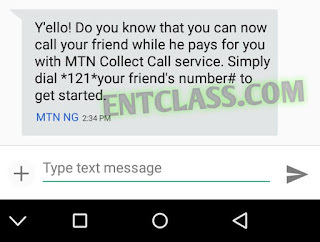 MTN Collect call is a special prepaid service that allows you to stay in touch with your friends and family even when you have zero credit balance provided that the called party accepts to pay for the incoming voice call. This comes very handy in situations where the caller has run out of airtime and other similar situations. You will not be required to pay a subscription fee or an access fee to use MTN Collect call service. With MTN Collect call, you get life enriching services that make you Live more, Laugh more and Love more. You will not be charged a subscription fee or connection fee to use the service. You will always be able to stay in touch with your family and friends even when you do not have credit. How Does MTN Collect Call Work? First, initiate a Collect call to your friend by dialling *121*your friend's MTN number#. If your friend has the minimum airtime required to sponsor the call. "Call in progress. Please wait while your call is being connected." When the system has confirmed that all the conditions in 2 above are OK, it will set up the call to your sponsor and s/he will also hear the announcement. "Welcome to MTN Collect call service. Press 1 to accept, 2 to reject, 3 to accept and add to white list, 4 to reject and add to black list". 4 to reject the call and add to the black list. If your Friend presses 1, the call will be connected and your friend will be charged for the call according to her/his MTN2MTN tariff plan rate. "Sorry, the call cannot be connected at the moment. Please try again later. Thank you!" If your Friend presses 3, the call will be connected and your number will be added to your friend's white list at the end of the call. If your Friend presses 4, the call will be rejected and your number added to your friend's black list. That's all friends. Hope you enjoyed this? Kindly comment and Share. Mtn collect call service code. MTN pay4me code. Mtn reverse number. Mtn collect call code. Mtn pay4me code. Until una thief our money finish sha.